The Rochester Knighthawks are celebrating their 25th Anniversary season in 2018-19. It’s a time to celebrate one of the oldest and most successful franchises in the National Lacrosse League. With a track record of turning out championship-caliber teams and All-Pros, it’s no surprise that the team has found similar success with its youth program, the Jr. Knighthawks. 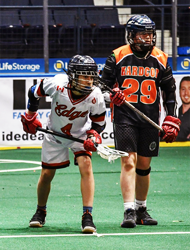 In two short years, the youth counterpart of the NLL franchise has quickly established itself as one of the premier box lacrosse programs in the region. 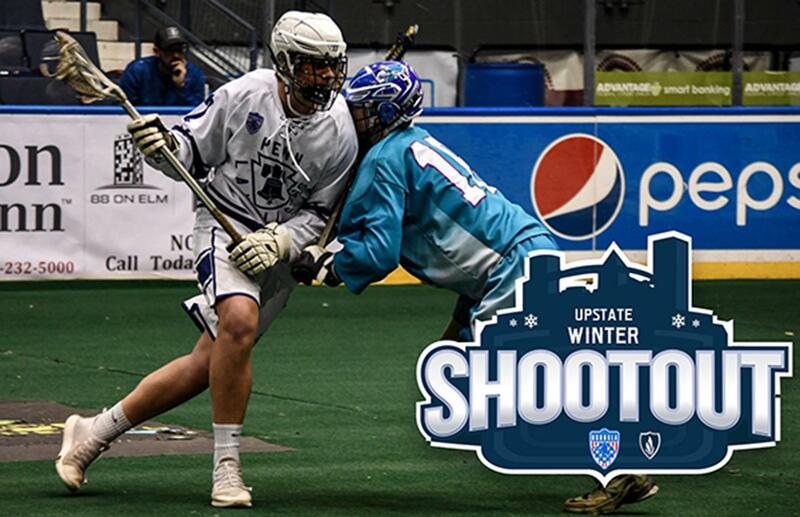 The Jr. Knighthawks recently hosted their Second Annual Upstate Winter Shootout (UWS) from Feb. 2 through Feb. 3. For the second straight year, the tournament sold out with a record 30 teams over four divisions taking part in the USBOXLA-sanctioned event. This year’s field of teams included USBOXLA clubs like O2 Lacrosse, Penn*Lax All Stars, EDGE Lacrosse and the Jr. Knighthawks. Kids competed in the Pee Wee (5th/6th grade), Bantam (7th/8th), Midget (9th/10th) and Varsity divisions. As part of the entrance fee, every participating player received a ticket to the Knighthawks’ game on Feb. 2 against the Georgia Swarm. The tournament, which was run in conjunction with Harvest Lacrosse, was held at two separate sites, Tri-County Sports Complex in Macedon, NY, and Connors & Ferris Field at The Blue Cross Arena, which hosted games at the Midget and Varsity levels on championship Sunday. “We’re so thankful to the teams that attended the UWS 2019 event, and we’re already expecting other big clubs and programs to join us in 2020,” said Harvest Lacrosse co-founder and Director Grant Catalino. “The participation from teams all over the country and Canada provides variety and new competition to attending teams, which is unique to our event. The parity in this year’s tournament was evident as each division produced a different winner. HardCor Lacrosse (Oakville, Ontario) captured the Pee Wee title and the Western Woodsmen (Cattaraugus) won gold in the Bantam age group. The most exciting championship game was in the Varsity division, as the Akwesasne Aces rallied from three goals down to defeat Everest Lacrosse (Thornhill, Ontario), 7-6. The final game of the tournament was in the Midget Division, as O2 National edged HardCor 8-5 in the title game. After yielding an early goal, O2 answered by scoring four of the half’s next five goals to move in front 5-2. Connor Waller was solid in goal as he preserved the win in the championship game. Offensively, Koleton Marquis scored three goals, while Wakon Cross posted one goal and four assists. Winning the gold medal was a sign of great things to come for box lacrosse in the United States. Not only did the program beat a well-established Canadian team in the finals; but they knocked off prestigious EDGE Lacrosse from Oakville, Ontario, in the quarterfinals as well. O2 is a North New Jersey-based club that fields a national team with players from New Jersey, Albany and Syracuse. Rochester native and former NLL pro Tim Soudan was equally impressed with his 3d Upstate Midget team, which advanced to the semifinals to play HardCor. “We had a really good group,” he said. “It was a great experience for all the guys. I was pleased with our group. We spent a lot of time working with them, and it showed. 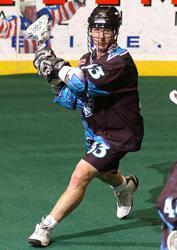 Soudan, who spent 11 seasons with the hometown Knighthawks, has been a strong proponent of the box game in his local community, and has worked numerous camps and clinics with the Knighthawks Youth Academy. Jake Bergey, who, like Soudan, was a veteran of the NLL, was in Rochester to watch his 14-year-old son Bret play for the Bantam Penn*Lax All Stars, which is part of the Fusion family. The program has ties to the Philadelphia Wings, where Jake played for 10 seasons. The coaching staff features former Wings Tom Slate and Ryan Traynor, and past Wings’ coach Adam Mueller. Current Wings’ star forward Kevin Crowley, who is one of the co-founders of Fusion Lacrosse, also coaches some of the Penn*Lax teams. It was at the urging of Slate, one of Bergey’s former teammates, that convinced Jake’s son to set aside basketball season for an opportunity to play box lacrosse this year. 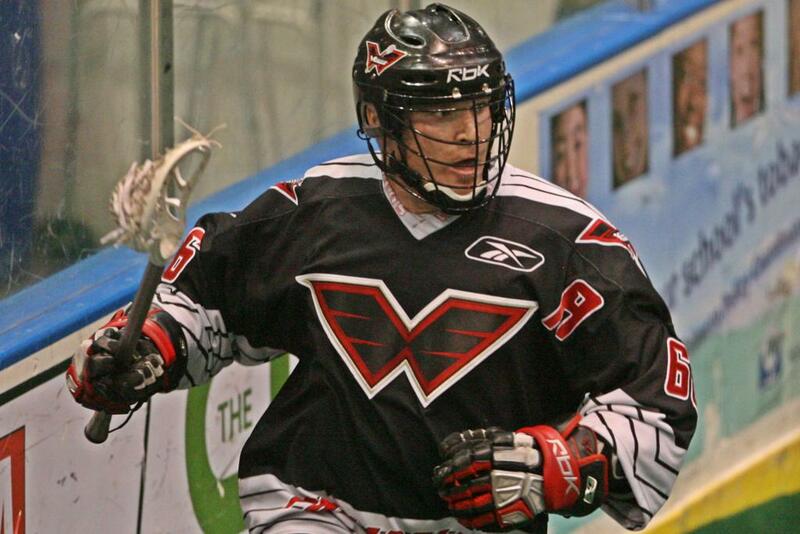 Known as one of the best American players in league history, Bergey was a two-time NLL champion with the Philadelphia Wings and retired as the franchise’s second-leading scorer. These days, the 44-year-old is back in the rink encouraging the next generation of players to take their game indoors. Bergey said that the growth of the box game has been accelerated by USBOXLA, which prides itself as the country’s largest and most recognized box-specific governing body operating today.